I actually sorta discovered this one on accident! Typically, I eat vegetarian, but I use stuff like butter, sour cream, and shredded cheese on my baked potatoes…. cause, ya know… that’s how I’ve always done it. Well, since I’m on a four-day Daniel Fast right now, I couldn’t. 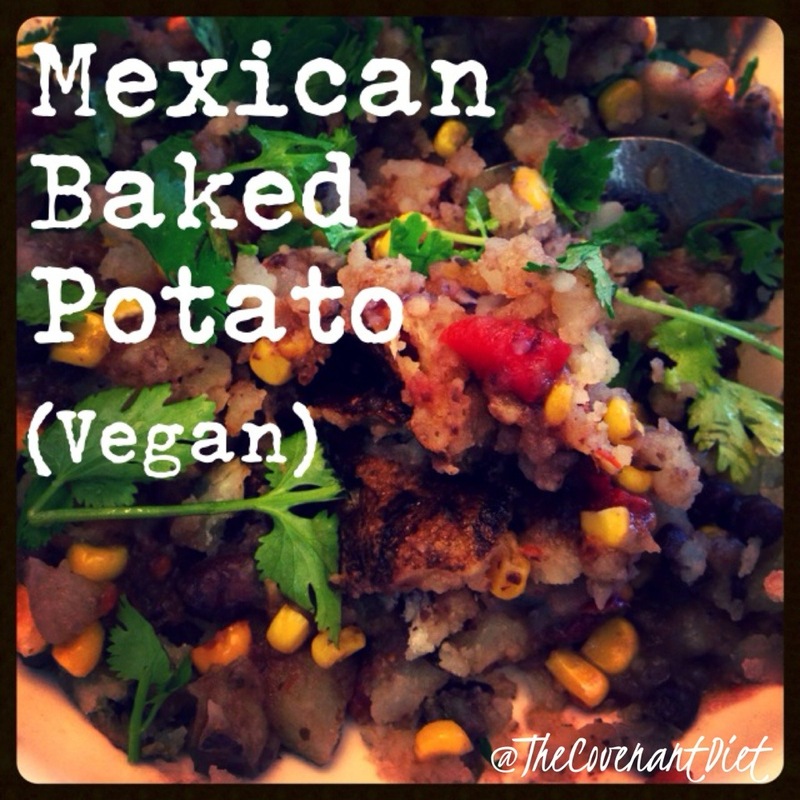 So I was planning on making a Mexican baked potato… and that’s what I did, but I made it extra good! I used the leftovers from my Black Bean Soup from last night, threw some frozen corn in while I reheated it, poured it on the baked potato along with some southwestern style salsa and a sprinkling of salsa… and heck to the yeah, it was GOOD! No butter. No sour cream. No cheese. Before we get started here with this crazy easy recipe, I do need to point out that I’m sorta finicky about my baked potatoes. No microwave for me… and not because of the health reasons but because they are so. much. better. when they are really baked in the oven (or crock pot). So, that’s why I’m giving some slightly specific instructions for how to bake a baked potato! Lay out a sheet of aluminum foil, place the potato in the middle and drizzle with olive oil and sprinkle with kosher salt. Once baked to where you can simply “smush” down on the foil wrapped potato and it “caves” in, then it’s ready to embellish! Pour the corn into the the leftover black bean soup and heat for two to three minutes on high. Pour the mixture over the baked potato. Add the salsa and mix around with the beans. And eat your worry-free meal… no butter. no sour cream. no cheese. But SO DELICIOUS! I like to bake my potatoes in the crock pot a lot in the spring and summer when I don’t want to heat up the house the with oven but still want an oven-baked taste. It’s also nice to not have to worry about babysitting the oven… this way I can leave and pick up my kids or run to the store while my baked potato is a cookin away at home! Wash and poke the potato. Place it in the bottom of the crock pot and pour in 1/4 cup of water or vegetable broth. Drizzle oil over potato and sprinkle with kosher salt.